With leaden skies and the days getting shorter and colder, it was time to inject a splash of colour on our front door step! No one wants their garden borders to be a muddy, lifeless patch in winter! 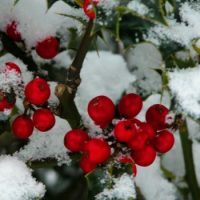 Though a touch of frost can transform the dullest of gardens into a magical wintry landscape, most gardeners aim to create an outdoor space, with delights which are less transitory. 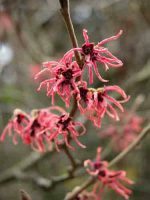 Choosing plants for winter interest usually means selecting attractive skeleton forms or handsome evergreen foliage, picking out plants with winter flowers or looking for colourful stems and interesting bark. 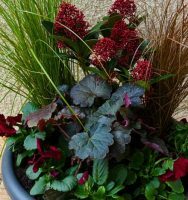 All of these can make the winter garden a pleasure to view from your kitchen window. December’s snow and ice have given way to rain and mud here in the Forest of Dean and, while I’ll be more than happy to dig out the toboggans again if the weather turns Arctic once more, for the meantime I’ve been seduced into thinking that maybe spring is just around the corner. A prowl around the garden and – yes, the first white bulbs are appearing amongst the green shoots along the hedgerow. 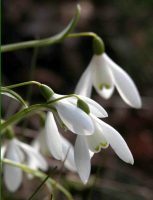 The snowdrops – harbingers of spring – are well on their way. From late January, gardens all around the country start welcoming visitors keen to take advantage of that brief time of year when the ground is carpeted with a blanket of snowdrops. I’m reliably informed that sloe gin tastes better and better the longer you leave it, but that’s a theory I’ve not had the patience to test! The sloes we picked last October had been infusing the gin with their gorgeous berry flavours for three months when the serious business of bottling-for-Christmas began. 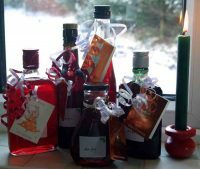 The eclectic assortment of bottles looked beautiful – lined up with their home-made labels and colourful twirls of ribbon – and I was all set to become the family’s favourite person this festive season. But what to do with all those gloriously alcoholic sloes?